Traveling can really beat up your skin so I’m very mindful of how I treat it while I’m on vacation. Here are a collection of tips and products I use to keep my face happy when I’m away from home. If it’s helpful to know my skin type before reading my opinions – I’m extremely fair, burn easily, and have very dry skin and lips (despite hydrating like a crazy person! thanks thyroid!). First, of course, you need to hydrate. That’s a no brainer for healthy, fresh skin. Second, another no brainer – you need to wear sunscreen. My favorite when traveling is the Neutrogena Ultra Sheer SPF 70 Face & Body stick. I really love that you can use it all over your body, not just your face. The coverage is excellent; I have never once gotten a burn when using this sunscreen. Third, you need to wash your face before you go to bed at night. Being out and about all day can mean a whole face full of gunk by the end of the day (sweat, sunscreen, bacteria, dirt, oil, weather/pollution, etc), and that stuff has to go! Fourth, it may sound intuitive, but I try to keep my travel face routine as close to my regular at-home skin care and makeup routine as possible. Don’t get me wrong, I sometimes use vacation as an excuse to take a break from makeup. But I do like wearing it and I prefer having a little on for pictures. 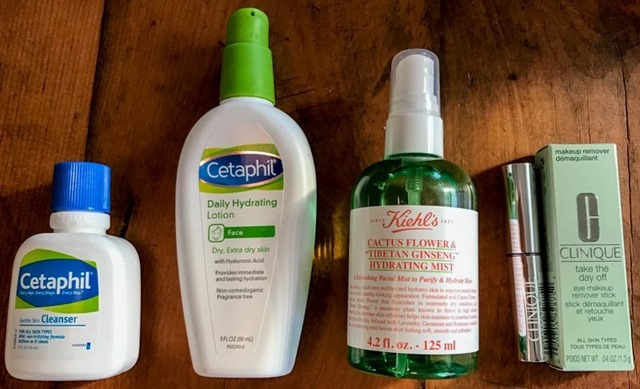 These are the exact products I use every day, just in travel sizes! Thankfully most brands make a regular and travel size options of their products. If not, invest in some good quality travel containers and make your own. Kiehl’s Cactus Flower & Tibetan Ginseng Hydrating Mist – great for a pick me up on the road or on a plane, perfect right out of the shower, can totally be worn on it’s own or under your moisturizer – it’s like a mini facial every time I use it! Smells unreal too! I keep my vacation makeup routine really basic. 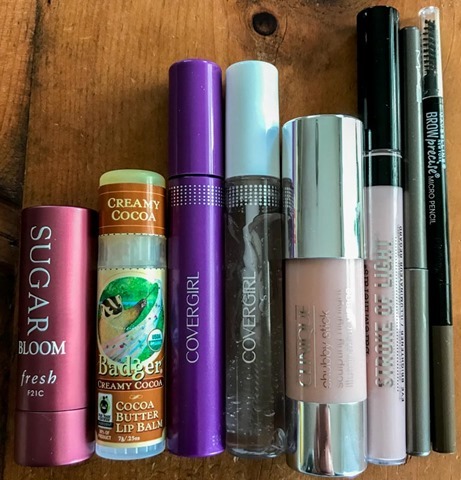 It’s for efficiency reasons – all of these items fit in my purse and I don’t have to carry a huge makeup bag, but also for practical reasons – I don’t like traveling with my high-end makeup that could break or get ruined in my luggage.